Balcony seen from my room at Chopin B & B in Warsaw. Wherever I go, whether in my daily life or in my travels, I constantly notice shapes and patterns. Even lying in bed, I suddenly observe how one board in the ceiling has long flowing curves, whereas the grain is more striated in the others. It's not that I don't take in the whole scene--the bigger picture--for I do, but my eyes are drawn to these lines everywhere. I find myself taking photos of gates, doors, windows, walls, bridges, floors, sidewalks, manhole covers, and more. Yet I don't necessarily incorporate them into my textile art as such. Except for one project, I've never deliberately used a photo as the basis for a piece. Still, all those shapes and patterns inspire me. Unwittingly, I store them in that visual memory part of the brain. Later, I might express them in some way, but without being conscious of that happening. We don't always know how what inspires us will be translated in our work and even go so far as to change our artistic direction. Floor at the Museum of the City of Lodz, Poland, formerly the home of the Poznanski family. St. Patrick's Cathedral. Dublin, Ireland. I've not written any posts lately because I was out of state and then out of the country for 5 weeks. During that time, I witnessed a great deal of art, but it wasn't until I viewed a special exhibit of American painter and printmaker Frank Stella at the Polin Museum in Warsaw that I started to reflect on the unexpected impact of inspiration. It was, seemingly, the most unlikely of inspirations. In 1970, American abstract artist and architect Richard Meier gave his friend Stella a book of drawings and photographs for his birthday. Published in 1959, Wooden Synagogues, by Polish architects Maria and Kazimierz Piechotka, is a detailed pictorial record of wooden synagogues throughout Poland that were decimated by the Nazis. Why would this lead the son of first-generation Italian-American parents to create experimental, irregular, large-scale, collaged and painted wall reliefs that he named for the towns where Jewish sacral architecture once stood? And how did making them become a turning point in his artistic career? First, Stella saw in the World War II march of Germans across Poland into Russia the trace of abstraction earlier in the century, recalling the path of Constructivism, an artistic and architectural philosophy that originated in Russia, beginning in 1913, by Vladimir Tatlin, and that influenced modern art movements of the 20th century. Second, as he "struggled" through the Polish pictures (photos and cross-section drawings), Stella found that they "opened things up for me so that I was able to use my gift for structure with something that modernism hadn't really exploited before, the idea that paintings could be constructed...Building a picture was something natural for me. Build it and then paint it." Łunna Wola II (1973), by Frank Stella. 97x107x5 in. Lanckorona I (1971), by Frank Stella. 108 x 90 in. Abstract art developed from Moscow to Warsaw to Berlin and then back the other way and that was the root of the development of abstract art in the beginning--well into the middle of the early 20th century, and that idea of abstraction just stuck in my head and then the actuality of the drawings and how the synagogues were made. I invented a word, I think I invented the word...interlockingness, whatever that means, but it was about the carpentry and about the craftsmanship that went into the joining and building of the wooden synagogues and basically of the structure that was built. Grodno synagogue: view from the south (1922). Photographer unknown. In an interview conducted by the San Francisco Museum of Modern Art, Stella goes on to explain how this inspiration resulted in shaping the canvas. Frank Stella at his West Houston studio with works from the Polish Village series, 1974. Original photo by Nancy Crampton. The real problem in painting has always been the same one--to make art--and so it's really a question of how you make art. Shaping the canvas was something that, I don't know, I just drifted into it. It had an appeal to me. I was never sure how much appeal it would have to anyone else. But I liked it. I liked the way it defined things and it defined the gesture of the painting in a way. Rather than having a painting full of a lot of gestures, the painting itself became a gesture. 'Make what you want to paint on' would sort of be my theme. I like to make what I'm then going to paint on. Odelsk I (1971), by Frank Stella. 90x132 in. Odelsk I (1971)--sideview--by Frank Stella. Bogoria V (1974/1982), by Frank Stella. 88.5x110.5x4.75 in. Bogoria V (side view detail) , 1974/1982, by Frank Stella. Bogoria IV (1971), by Frank Stella. 90x110x5 in. Olkienniki III (1972), by Frank Stella. 95x84 in. Inspiration can come from anywhere. All we have to do is pay attention to what intrigues us, moves us, captures our imagination. How has what inspires you affected your work, even changed your artistic orientation? Although I lived in Hawai'i for nine years, I don't remember ever thinking of featherwork as artwork. I knew that Hawaiian royalty (ali'i) had worn feather cloaks and capes, but that's what they were in my mind at the time--cloaks and capes--in the way that European kings and queens wore such garments. 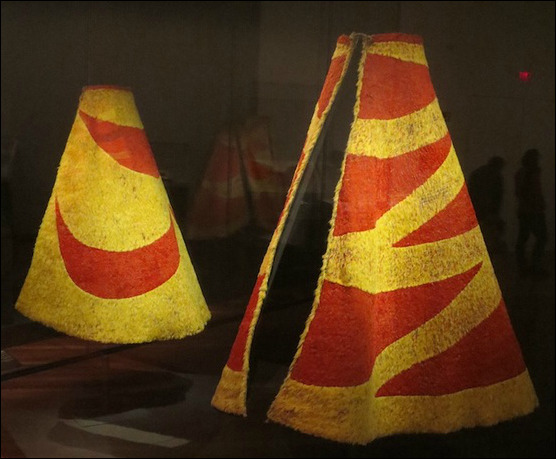 But a recent visit to the De Young Museum in San Francisco changed how I view those 'ahuʻula ("red shoulder coverings"). I admire the collected pieces for their artistic mastery, especially the simple but bold contemporary-looking abstract designs and colors. I could easily see them rendered with textiles or paints. Since bundles of feathers were tied together and attached to netting made of olona (in the nettle family), one of the strongest natural fibers in the world, can we call the 'ahuʻula fiber art? Amazingly preserved, the items are from the 18th and 19th centuries. For the San Francisco exhibit, they were gathered from Honolulu's Museum of Art and Bernice Pauahi Bishop Museum, Harvard's Peabody Museum of Archaeology and Ethnology, National Museum of Natural History of the Smithsonian Institution, London's British Museum, Museum of New Zealand Te Papa Tongarewa, and Vienna's Museum of Ethnology, Weltmuseum. 'I'iwi (Vestiaria coccinea), scarlet Hawaiian honeycreeper. When I first heard of featherwork in Hawai'i, I was taken aback by what I thought must have been wholesale slaughter of endemic birds. I've since learned--only to my partial relief--that birds were captured and their feathers plucked. The Hawaiians knew that, alive rather than dead, the avian wonders could regenerate more feathers. Regardless, I doubt the birds thought it a pleasant experience. Eventually, disease, habitat destruction, and introduced predators took their toll, leading to extinction in some cases. But, for a long period, the birds provided the wherewithal for royal men and women to drape themselves in garments that were believed to afford spiritual protection as well as proclaim their noble status. Now we can view these beautiful pieces in museums. In addition to the short capes and long cloaks, there were also feather garlands (lei hulu), handheld feather standards (kāhili) that signified divine power, and feather helmets (mahiole). The latter remind me of a partial wheel with hub and spokes. They were created by fastening feathered netting onto a twined rigid form of 'ie'ie (Freycinetia arborea), densely branched, woody aerial roots of the plant family Pandanaceae that attach themselves to host trees. These roots allow the feathers to maintain a particular shape, orientation, and arrangement. 'Ie'ie (Freycinetia arborea). Photo by Forest & Kim Starr (USGS), Plants of Hawaii. I can't help but think of a slice of watermelon when I look at this last one. But it could represent something I'm just not aware of or it could simply be the feather artist's unique design. If you're at all drawn to these feather creations, may they lend inspiration for your own artwork. How do these designs strike you? Do you see cultural or environmental symbols in the abstract patterns? If you didn't know that they're made of feathers, what would you think they are? Have you incorporated feathers in your artwork--how? If you were to guess what sort of landscape people universally like--from Africa to America to Asia to Australia--how would you describe it? According to aesthetic philosopher Denis Dutton, author of The Art Instinct: Beauty, Pleasure, and Human Evolution, it would be similar to the landscape of our Pleistocene ancestors: open spaces with low grasses and copses of trees, especially those that fork near the ground (for easy escape from predators?). An example is the scene below from South Africa. There could be evidence of water, animals, and birds. And the picture could contain a path or road, a riverbank or shoreline, extending into the distance, as though beckoning us to follow it. What's particularly fascinating is that this landscape is regarded as beautiful by people in countries that don't even have such terrain. Dutton points out that it shows up on calendars and postcards, in designs of golf courses and public parks, and in framed pictures hanging on living room walls around the world. Artists create all kinds of landscapes for all kinds of reasons. In the late-19th- and early-20th-century, many Western artists were driven to create landscapes in part because of their dissatisfaction with the modern city. They imagined earthly paradises in paint. Others simply have wanted to capture impressionistically the essence of Nature's beauty around them, or to remember a place they visited. Some wanted to realistically depict the details, especially before photography was invented. And then there's simply the desire to delight in colors and shapes. Based on certain philosophical traditions, a spiritual element might be integral to the landscape picture, creating more of a "mindscape," as in this painting by Australian artist Maria Gorton, or that of Canadian artist Lawren Harris, currently exhibited at the Museum of Fine Arts, Boston. "One Moon, Many Waters," by Maria Gorton. Photo courtesy of the artist. Landscapes have gone in and out of fashion in the art world, but they still command our attention. They can be exotic or familiar, bucolic or grand, remote and wild, fantastic or mystical, totally abstract or fully representational. They can be screen-printed, painted in oils, watercolors or acrylics, composed with textiles, sketched in ink, charcoal, pastel or pencil, etched, engraved, captured by camera, and so much more. Here are a few from different times and places and in different mediums. Can you guess when, where, and how? In an interview conducted by Krista Tippett for her program "On Being," the Irish poet John O'Donohue says, "What amazes me about landscape is its Zen thereness. In a certain sense, landscape recalls you into a mindful moment of stillness, silence, and solitude, where you can truly receive time." "Avenue of Poplars in Autumn" (1884), by Vincent Van Gogh. "South West African Landscape with Termite Hill, Umbrella Trees and Mountains in the Background"
"The beauty of nature," O'Donohue continues, "is its generosity." He refers to the Celtic view of landscape as not just matter but actually something alive. It's not simply the outer presence of the landscape that affects us. There's also something that connects us to the elemental, to the rhythm of the universe. "Reflected in the Gualala River." Photo by Rick Denniston. What kind of landscapes are you drawn to--peaceful, stormy, mythological, realistic, bright or chiaroscuro, minimalist or detailed? If you create landscapes, what kind, and in what medium? I think that the power of art is the power to wake us up, strike us to our depths, change us. What are we searching for when we read a novel, see a film, listen to a piece of music? We are searching, through a work of art, for something that alters us, that we weren’t aware of before. We want to transform ourselves, just as Ovid’s masterwork[Metamorphosis] transformed me.